Categories: Azhwars, Bhakti, Divine Names, Koorathazhwar, Music, Prayers, Worship. The jayanthi day of Sri Madhurakavi Azhwar was celebrated in May this year. It was through the chanting of this Azhwar’s 11 verses that the 4000 verses composed by all the Azhwars were recovered. 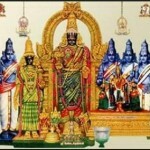 Take this quiz to test your knowledge about the Azhwars. 1. Which God did the Azhwars primarily worship? 2. How many Azhwars are there? 4. How many verses did all the Azhwars compose? 5. Who was the saint who retrieved all the Azhwars’ verses which were considered lost? 6. Which Azhwar was called Vipra Narayana? 7. Which Azhwar composed all his verses in praise of his Guru? 8. Which Azhwar remained mute and lived under a tamarind tree for 16 years? 9. Name the Azhwar who had great devotion to Lord Rama. 10. In which language did the Azhwars sing praises of the Lord? 11. Which Azhwar composed ‘Thiruppavai’?